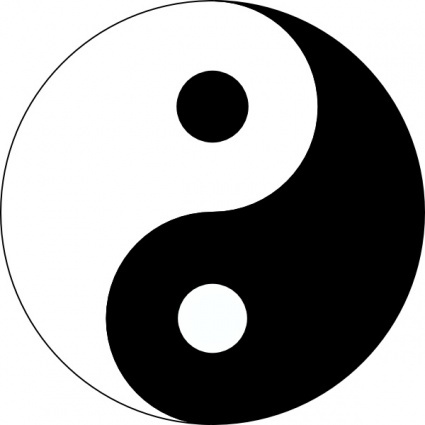 The Yin/Yang symbol is well-recognized by most of us, but it wasn’t until I studied feng shui that I really understood what that funky black & white symbol meant: polar opposites living in harmony. The dark areas are Yin, the light areas are Yang. The Yin/Yang symbol should be traditionally shown rotating in a clockwise direction – representing the circle of life. The beginning years of life (birth/toddler) is the tail of the Yang (light)energy, moving into the larger area of Yang energy being the childhood/teenage years. The beginning of Yin (dark) energy depicts adulthood moving into the larger area of Yin energy of the senior years of life & death. This symbol also represents the cycle of each day (sunrise, noon, sunset, midnight) and the four seasons of each year (Spring, Summer, Fall, Winter). Life is a flow of changing energy! YIN: feminine, cool/cold, even, passive, wet, winter, dark, low, soft, small, slow, rounded, curved, black/silver, death, ornate, negative, matte, left, back, floral, textured, inward, still, sinking, receptive, valley, horizontal, contracting, wide, moon, earth, listening. YANG: masculine, warm/hot, odd, active, dry, summer, light/bright, high, hard, large, fast, sharp, angular, straight, white, life, plain, positive, shiny, right, front, geometric, smooth, outward, moving, rising, projecting, mountain, vertical, expanding, narrow, sun, heaven, speaking. In Feng Shui, we design physical spaces to have this harmonious Yin/Yang balance. Rooms need a different ratio of each depending on their purpose. For example: kitchens and children’s play areas need more Yang characteristics to support their active energy – bright task lighting, smooth uncluttered work surfaces, and lighter wall colors. Adding touches of Yin such as horizontal striped fabric, a few dark-colored accessories, flowers, or black framed pictures, will soften the energy and create a sense of comfort. Bedrooms and dens should have more Yin energy to support quieter activities such as reading and sleeping. Soft throws and bedding fabrics, lower lighting, and curved or softened edges on furniture are excellent options. A bit of Yang energy for balance could include white linens or geometric patterned fabrics, vertical stripes on draperies or one large piece of furniture such as a canopy bed or armoire. Just make sure you don’t have all of these going on. Bedrooms can have too much active Yang energy if all of the furniture is large or white, the walls are light-colored, the bedding is white, and there are no fabric window coverings. Work desks and exercise equipment also carry Yang energy, the polar opposite of rest & relaxation. 1. Find a piece of paper and choose a room in your house that doesn’t feel quite right. Write down the room’s name and List the activities being performed in that room (example: our family room is where we spend most of our time watching TV, playing with our dog and visiting with each other). 2. Make two separate columns on the paper – Yang and Yin. Referring back to the chart above, list all of the items you see in each category, also noting whether it has a large or small impact in the room. For example, light-colored walls and/or flooring have a large Yang impact. A bold-colored toss pillow or smooth table lamp demonstrates a small impact. 3. After you finish evaluating the Yang qualities of the room, do the same thing with the Yin qualities in the other column. You can use this process to evaluate any space that doesn’t feel quite right. I love the explanation my mentor, Terah Kathryn Collins used when describing how we perceive our spaces: “We are a Goldilocks society…………we want things to feel just right – not too cold, not too hot, not too soft, not too hard, not too dark, not too light..but just right!” The Yin/Yang chart is a great tool to use if a room feels out of balance for its purpose.